Photographing the sky is a tricky and frustrating thing at first. Most successful images come from a combination of three things: location, luck, and gear. Until last night, I've never seen the Milky Way in person. It's one of the most popular galaxies to photograph because it takes up so much of the sky. The first part of getting a photograph like the one below is location. 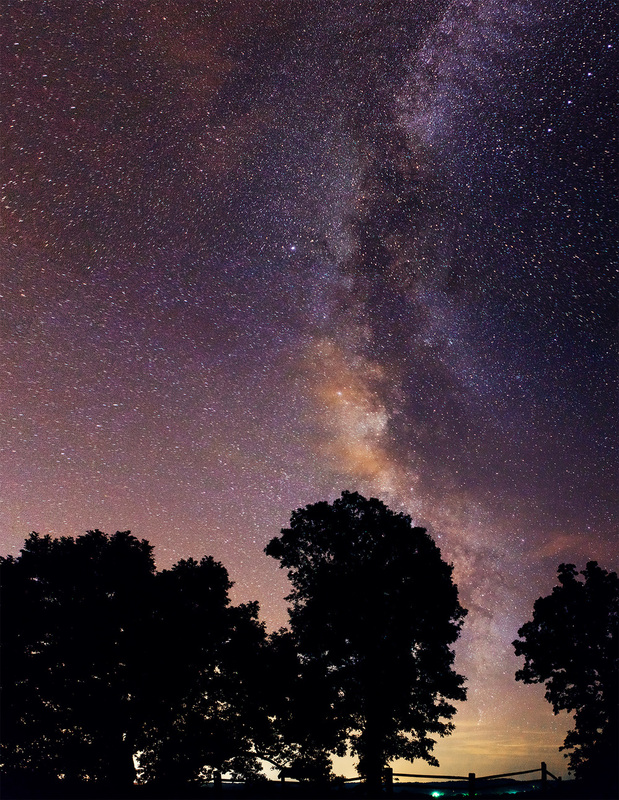 We drove about an hour outside of Nashville down the Natchez Trace to get to a place where we looked up and saw this magnificent view above us. There are maps out there that show light pollution and you usually have to get about an hour away from the suburbs to be able to see stars clearly. The second part, luck, plays a big part in how successful your trip will be. We got there on a clear night, but by the end of our shoot, clouds and fog began to roll through the valley. We got a total of three hours of shooting in, and that was plenty of time to find interesting compositions and angles! While I have a few shots of just the galaxy on its own, I like the shot below because it gives you perspective of size and place. Having something to frame the galaxy with really helps. Gear probably plays the least important role, in my opinion. Most cameras nowadays have the capability of shooting at higher ISO's (sensitivity to light). Use the widest lens you have (even your kit lens will work). In my case it was a 24mm. Then, use the lowest F/Stop (aperture) setting and start off at 3200 ISO. That seems to be a safe place for most cameras. A tripod is a must, and a wireless remote will save you lots of troubles! If you don't have a wireless remote, set your camera on a timer, so that you can press the shutter button and not worry about the shake you create. This shot was taken at ISO 3200. You can see some of the stars are blurry, which is because I probably pushed the 600 rule a bit too far. What's the 600 rule, you ask? The 600 rule is to ensure that you don't get any of the earths rotation in the frame. Take your focal length (lens millimeter) that you'll be shooting at, and divide 600 by it. That will give you the maximum length of time your shutter should stay open without getting any rotation. For this shot, I was at 24mm, ISO 3200, and my shutter stayed open for 30". I used a tripod to steady it, and forgot my wireless remote so I had to set it on a timer so there's no shake from me pressing the button. If you take 600 and divide it by 24, you'll end up at (25 seconds). The blur of some stars comes from me shooting at 30" to let a bit more light in. Always shoot in RAW if you have the software to edit RAW files (Yay Lightroom!). You can see clouds and fog in this image. It was time to head back home and edit! Feel free to leave comments below or ask questions! Have fun exploring and make sure to bring your camera.